You can download Prokaryo for Mac OS X here. The Human body consists of about 100 trillion cells. They are the functional units of life. Can you imagine flying through one of these cells and investigating the cell at a sub-cellular level? Created in the LINDSAY Composer, Afshin Esmaeili’s multi-agent model on the E. coli bacterium allows for the exploration of a prokaryote’s internal systems. A biological cell is a system in and of itself. It is a dynamic world filled with complex interactions between different kinds of proteins, polysaccharides, water molecules, ribosomes, and many other biomolecular elements. 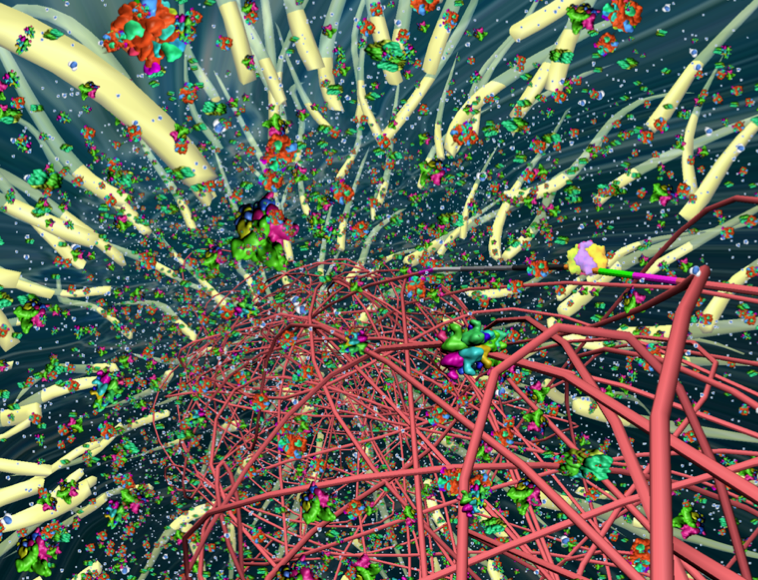 Afshin Esmaeili’s “Prokaryo: Multi-agent Simulation of an E. coli” leads us on a journey into the complex factory of a prokaryote. “Prokaryotes lack a nucleus, so their genetic information lies in a plasmid. E. coli bacteria can be found in many different places in the human body”, says Esmaeili. He has focused on E. coli (Escherichia coli) bacteria found in the large intestine of the human body. E. coli is essential for the large intestine because it provides its host with vitamin K (can synthesize vitamin K2). There are only very few bacteria that maintain such a mutual relationship with humans. Navigating inside an E. coli bacterium. Visible are different kinds of proteins (such as beta-galactosidase, RNA polymerases, ribosomes, repressors, …) and other molecules (lactose, glucose, galactose). The red structure represents the DNA strand. At the centre right is the regulatory unit of the lactose operon. Why model an E. coli bacterium? 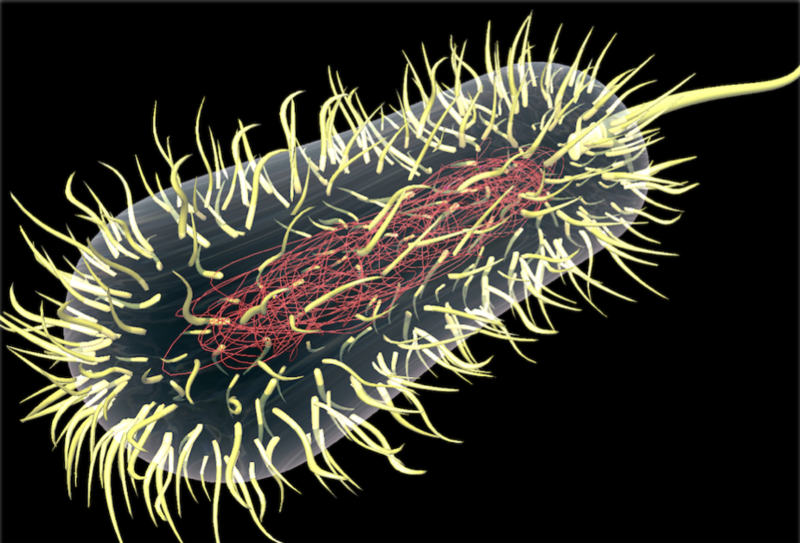 E.coli has been at the center of many biological discoveries due to its ease of growth and versatility. Researchers have enough information and genetic data on E. coli so that it turns out to be an excellent model organism to study all of its metabolic and gene regulatory processes. Esmaeili’s project provides a fascinating journey through an E. coli bacterium — a very unique experience. Flying through a bacterium, one feels immersed in a world of biomolecules, being surrounded by millions of particles traveling through and interacting with one another — and all of this happens live in front of your eyes. Outside view of our E. coli model. Clearly visible is the DNA in red, the cilia (yellow bristles) and a large flagellum at the back. Afshin focuses on the nucleoid region within the complex structure of E. coli, where gene expression occurs. Why is this particularly interesting? Well, this is the region where a prokaryote’s DNA is stored. Gene expression occurs in this area. This microscopic region is in fact large, considering that it is the origin of all of a bacterium’s phenotypic and genotypic characteristics. Our Prokaryo model running on an iPhone 4. Here is a quick preview of the E. coli bacterium model on an iPhone. Prokaryo has been successfully ported from Mac OS to iOS. We will make this mobile version available soon. The model behaves exactly as it would on the desktop version, which includes all physical interactions and graphic visualizations. This truly opens new avenues to explore such a 3-dimensional model and experience a journey inside a bacterial cell.